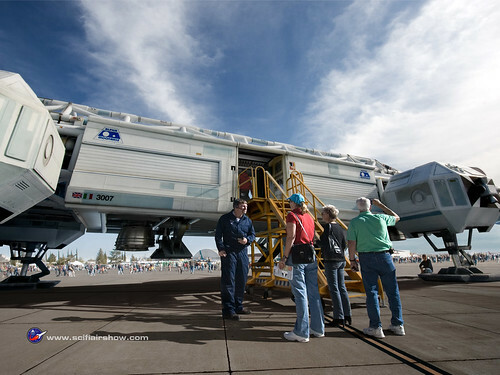 A curious bit of making science fiction fact which is one of the themes and motivations and conventions of design fiction is the Sci-Fi Airshow, a tour of the various air/spacecraft from your favorite science fiction shows. It’s all done in the stylings of the airshow, as the name suggests, where pilots and fans gather at a local airbase and gawk at the fascinating flying machines. The significance of airshows is precisely this — the gathering of fans to invigorate and extend and flex their creative, intellectual and technical affinity for flying machines of a particular variety. I used to enjoy going to airshows — it was the geek in me, mostly, as well as adolescent fantasies of wearing coveralls, a sheep skin’d collar’d bomber jacket and an ascot. And of course all the technical aspects of flying a machine. What the creators of the Sci-Fi Airshow have done is extend that fascinating imaginary into the realm of science fiction flying machines. They make the flying machines somehow ordinary insofar as they appear at a typical airshow with families and fans enjoying the machines, the sunshine and a chat with a pilot. In this way, the objects become tangible. There’s a playful confusion that is going on with the conceit of the Sci-Fi Airshow website. The backstory tells a bit more, with motivations similar to those of the best design fiction creatives — a young obsession with engaging, creating and crafting the fantastic worlds of their imaginations and sharing them in as compelling and provocative a way as they could. In this case, it is this artist Bill George or traces his passion with this kind of story telling to a lent copy of The Making of Star Trek. Why do I blog this? A wonderful instance of playful science fiction that provides some ideas and insights into how we can communicate ideas by making the extraordinary ordinary.